Opinion: Eee PC or cheapo full-spec laptop? What should your choice be? So the Asus Eee PC has been given a new lease of life. But it’s hardly the revolution we were hoping for. In fact, the more sceptical among us might ponder why Asus has even bothered. Yes, the screen is bigger, and the unit we’ve seen is no longer underclocked. But there’s not a lot to excite in the new model. However, the new Eee could help with one thing – our perception of it as a £200 laptop. Like it or not, the top-end £329 Eees are now straying into the same price bracket as a fully-specced cheap 15-inch laptop. And that’s interesting for the future of the whole sub-notebook concept. Because unless these things are cheap, you need to have a compelling reason to buy them. Your goal must be ultimate portability, because it sure isn’t going to be functionality. Whereas even the cheapest £350 Intel Pentium dual-core lappies are going to blast through anything aside from video handling and games, the Eee will fall early on like a Duracell bunny packed with own-brand. The arrival of Intel Atom will create a steep change in power for the sub-notebook. Yeah, so it won’t be dual-core to begin with, but we should start to see some exceptional battery life and better performance. However, we’re rather undecided as to what these are going to cost. One of our colleagues suggested he wouldn’t be surprised to see a £500 Eee PC before too long. While I think that’s a little wide, the initial Atom machines probably won’t be too far off. And then, unless you need the incredible portability of the Eee PC, surely you’ll just plump for a cheap notebook instead. I didn’t have to look too far for an illustrative example. Inside a copy of PC Plus magazine on my desk, the slim Dell Inspiron 1525 starts at £349 including VAT and delivery. 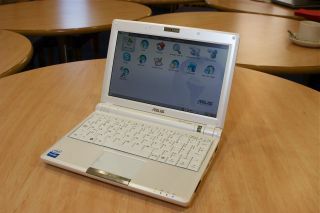 It packs in a 15.4-inch widescreen, Windows Vista Home Premiun, 1GB of memory and 12GB hard drive. Downside? It's 2.7kg, though you get my point; in terms of the broader market, the Eee can never compete with that.